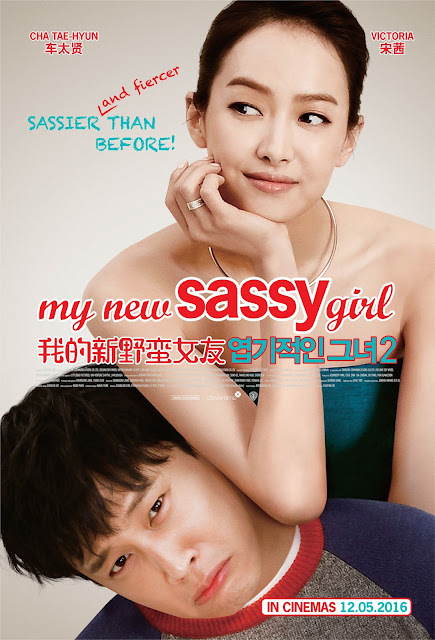 A sequel to the 2001 hit romantic-comedy "My Sassy Girl" - Cha Tae-hyun returns to reprise his role as Gyun-woo together with Victoria (member of South Korean girl group f(x)) as the new ‘sassy girl’. Born in 1968. Graduated from Seoul Institute of the Arts and KAFA majoring in film-directing. Cha Tae-hyun (born March 25, 1976) is a South Korean actor and singer. Internationally, he is best known for his lead roles in the box-office hit comedies My Sassy Girl (2001) and Scandal Makers (2008). Song Qian (Chinese: 宋茜, Hangul: 송치엔; born February 2, 1987), better known as Victoria Song or mononymously as Victoria, is a Chinese singer, dancer, actress and model. Over the years, Victoria has been active in various Korean and Chinese entertainment outlets. Following her debut with the South Korean girl group f(x), Victoria gained fame as part of a virtual couple with Nichkhun in We Got Married Season 2, as well as being a cast member of KBS's Invincible Youth. She won the Popularity Award at the MBC Entertainment Awards. She also began to take up acting in China, playing lead roles in dramas such as When Love Walked In and My New Sassy Girl, and won the Best New Actress Award at the China National Drama Awards. Victoria is very popular in China, with more than 18 million followers on Weibo, ranking fourth most followed K-pop celebrity as of April 2015. She was ranked 80 on The 2013 Independent Critics List of the 100 Most Beautiful Faces and first on Sohu's 2011 Entertainment World's 50 Most Beautiful People. In 2014, she won the "2014 Goddess of Asia" poll with 579,298 votes. She was also named one of the top ten most popular celebrities on Baidu, ranking at 7. The sequel rely on the success of My Sassey Girl in 2001, but came short of plot in the movie. The original was funny, comic driven and has a emotional component into it. The new movie is a combined production of Korea and China. With a much bigger China market, the movie hope to capture a large audience who still have memories of the 2001 movie. The movie is still funny but when compared to the original, I just smile at it but not with the big laughters I had when I was watching the original movie back then. The winning expression of Cha Tae-hyun ( main actor ) still have the same magic as in the original movie. I guessed we love his sad but pitiful expression. In one scene that kept the spirit of the original movie was when Victoria Song, vent her anger, by whipping Cha Tae-hyun with a wet towel. Somehow, it brings back a strong memory of the tortured character of Cha Tae-hyun. Mandarin dialogue are spoken and have been some focus of comedy targeting at the China audience. The beautiful countryside of China does help us to appreciate the beautiful scenery of rural China with China minority race dressed in their traditional colourful costume. An attempt to bring Chinese culture into the movie. Overall, the movie is still watchable but with it's weak plot, it was not as fantastic as the original movie back in 2001. The impact felt from this movie is also not as great as the previous one. I shall rate this movie at 2.5 / 5. The movie is currently is showing in cinema near you.